Bulletproof Coffee, Modafinil, nootropics, microdoses of acid, caffeine from coffee, caffeine from bracelets, aromatherapy, noise-canceling headphones, meditation, custom co-working spaces, or productivity apps? What we seek is that elusive, perfect focus or flow state. According to researchers, someone in flow will experience a lack of sense of self, a decline in fear, and time distortion. It is peak performance coupled with a euphoric high. All your happy neurotransmitters fire, and your dorsolateral prefrontal cortex performs differently –you do not second guess yourself, you quite simply just flow into the next stages of the activity at hand. And you happen to be performing at the highest level possible. Sounds amazing, right? But how do we invite this state in? A detailed piece in Fast Company outlines how extreme sports (professional surfing, steep incline skiing, skydiving etc.) are the quickest way we’ve found to tap into human flow. Yet, these hobbies are just that — extreme. They require a large amount of skill and can be dangerous. For example, Steven Kotler, a pioneer in flow state research, broke almost 100 bones as a journalist researching the topic. It all leads back to our collective (and very American) obsession with input versus output –are we achieving the most possible with the energy we put in? For all the bells and whistles at our disposal, we as a society are steadily declining in productivity as time goes on. In 2014, a Gallup Poll found that the average American worker only spends a depressing 5% of their day in flow. A 2016 Atlantic article hypothesized that the main reason that we’re decreasing in productivity as a workforce is that we’re not introducing new technologies quickly enough. Tech like robotics and smartphones could add a productivity push, but aren’t being integrated into the workplace. Business models are for the large part not that different from 10 years ago. In essence, we’re bored — we’re not being challenged in an engaging way, so we’re working harder than ever but achieving less. I first met Job Stauffer, Co-Founder and CCO at Orpheus Self-Care Entertainment when I was, in fact, procrastinating from work. I was scrolling through Instagram and saw a clip of Job playing RaveRunner. As I love rhythm games, I immediately requested a build. Yet, I’d soon learn that this wasn’t just a simple VR experience. 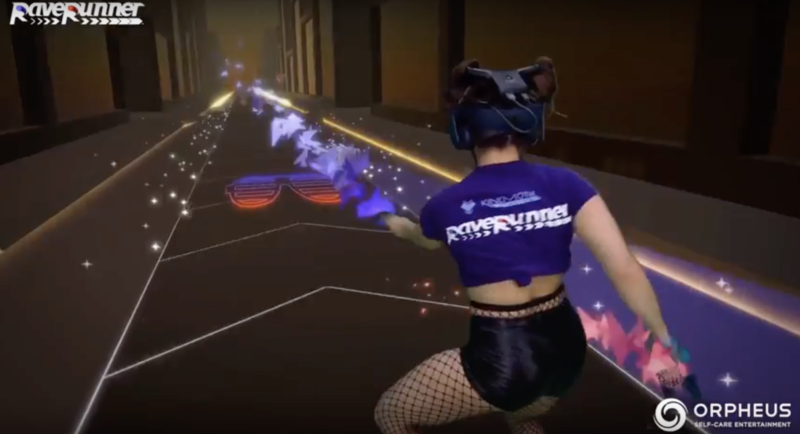 RaveRunner was built for Vive, but easily ran on my Rift. When I first stepped into the game, I felt a bit overwhelmed — there was a lot of dark empty space; almost like something out of TRON. It was a little scary, which is actually very helpful for entering flow state. However, my fear soon dissipated as before me was a transparent yellow lady (Job calls her “Goldie”) dancing with the beat — providing a moving demo for gameplay. Unlike the hacking nature of Beat Saber where you smash blocks with lightsabers, in WaveRunner you touch blue and orange glowing circles with your controllers, and move your whole body to the rhythm of the music. There’s a softer, feminine touch to WaveRunner, and it wasn’t just Goldie. Behind the design of this game is a woman, Ashley Cooper, who is the developer responsible for the gameplay mechanics that can help a player attain flow. “Being in the flow state is incredibly rewarding and we strive to help people reach it by creating experiences like RaveRunner,” says Cooper. RaveRunner is a game you can get lost in, and by stimulating so many senses it allows you to let your higher level thoughts slip away — you become purely reactionary and non-judgemental. After playing in this world for an hour, I called Job and learned more about his company. Apart from RaveRunner, Orpheus has also rolled out two other experiences — MicrodoseVR and SoundSelf. I got my first hands-on demo of all three products in one sitting at a cannabis technology event in Los Angeles, Grassfed LA. Grassfed is specifically geared towards higher brow, hip tech enthusiasts; and the Orpheus suite of products fit right in. As I lay in a dome with meditative lighting; a subwoofer purring below me; SoundSelf gave me one of the most profound experiences I’ve ever had in VR. I chanted into a microphone and my voice directly influenced the visuals before me. It felt like my spirit, the God particle, whatever you want to call it, was being stimulated from all these sensations. It was such a beautiful experience, but also was pure flow. I felt 2 minutes pass in the experience. I would have bet a hundred dollars on this. But I was inside for 10. Time didn’t make sense — a key indicator of flow state. As for me, along with the peppermint tea, grapefruit candle, and music that make my focus possible, I’ll now be adding some Orpheus games into my flow repertoire.